Yesterday, Gauge had his 15 month well baby appointment with Dr. Lee. I just love looking at his growth chart and seeing how he is such a big healthy boy! When we brought him home from the hospital he was so skinny. His 0-3 clothes just fell off of him. I remember mom and I running to Walmart just to buy him a few newborn outfits so he would have something to weigh. He was born full term at 7lb. 12oz., which is huge compared to Gracie who only weighed in at 6lb. 5 oz. But still he seemed so tiny. Dr. Lee asked if I had any questions or concerns. My only concern (and I'm sure some of you mothers out there are going to roll your eyes at this *wink*) is that Gauge sleeps A LOT! I don't think you understand how much this boy can sleep. During the week he only takes one 1 hr. midday nap. He goes to bed at 7:30 pm and sleeps until 7:00 am. But here's the kicker. On the weekend he will literally take a 5 hr. midday nap and then still want to go to bed at 7:30 pm. There are times that I feel like I hardly get to see him on the weekend because he's sleeping. Dr. Lee told me not to worry about it because he his a very healthy boy who is growing and developing as he should. He has energy when is is awake and is a good eater! With that being said, I guess I should be thankful he is a good sleeper and that it allows us to actually get some thing accomplished around the house on the weekend. He also had to get one shot yesterday and did very well. Just a tiny bit of crying and he was done. Mommy's little boy was brave! 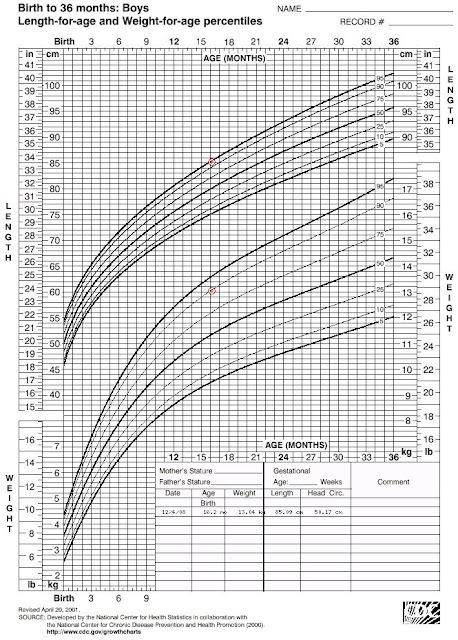 Our daughters' doctor always shows me the growth chart too. At our last appointment my twins were still on the low end for both height and weight. They eat ALL of the time so I'm not worried and I knew they would be short since I am. Glad all went well at your appointment and that everyone is healthy.